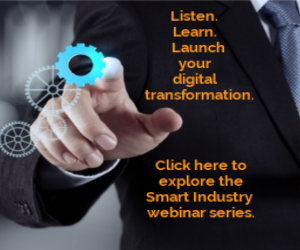 The Smart Industry 50 program was created in 2016 to recognize and honor individuals across industry who were making a difference in their organizations’ pursuit and embrace of digital transformation. Nominations for this year’s class of 2018 were solicited from the readers of Smart Industry, from past recipients of this recognition, and from more than 20 editors across the Putman Media family of industry publications—journalists and engineers who have developed deep relationships with the various vertical niches and functional swaths that their communities of readers represent. The full list of our fifty honorees is spread across the pages that follow, along with more in-depth profiles of many of them. We hope you find their personal stories as inspiring as we do, and join us in congratulating them on their accomplishments. AGCO’s Peggy Gulick took an interesting path to her current role as director of digital transformation for the global leader in agricultural equipment and solutions. She started out studying English and art, but ended up in information technology. From there, she landed a job not in IT architecture or application development, but in the midst of an SAP deployment. It was there that she found her passion wasn’t for IT itself but for the processes that IT was created to support. “Studying processes and making them more efficient—I loved it,” she says. A series of roles in IT and process followed, including global business process responsibility for Pure Fishing, a sporting goods manufacturer. “When I came to AGCO, it was a new position that merged the IT and lean teams,” she says. And now, with a new responsibility for global digital transformation, she’s working to spread the culture she helped develop at the company’s Jackson, Minn., facility across the company’s more than 40 manufacturing locations around the globe. With responsibility for driving the implementation of new technology within Dow’s manufacturing organization, Billy Bardin is among those digital innovators who today are defining the future of process technology. Dow Chemical’s Bill B. Bardin believes that digitalization and the IIoT represent a new generation of process technology advancement, much like the pneumatics that gave way to distributed control systems several decades ago. Bardin’s no stranger to seeking out faster, more efficient ways to effect positive change in the organization, having helped steer the company’s efforts to bring the pharmaceutical industry’s “high throughput” research methodologies to the commercialization of new catalysts and materials. Advances that in the years since have yielded significant results not only in profitability but in energy savings and sustainable operations, too. Looking forward, Dow promises to build an increasingly Digital Dow, with a digital thread across the company’s entire value chain. “The fun part of my job is setting us up for successful value delivery in the near-term, while establishing a path for the next 20-30 years that optimizes our manufacturing assets, data, and connectivity,” says Bardin. A master black belt in the Lean Six Sigma methodology, Carlos Ruiz learned early on in his career that new systems and process will only deliver results when people are at the center of the plan. positions in industries ranging from automotive to packaging to consumer packaged goods. Today, he’s responsible for manufacturing engineering and operational excellence in North America for L’Oreal, the global cosmetics powerhouse. It’s hard to imagine a manufacturing industry more impacted by society’s digital transformation, or the extremes of “batch size one” mass customization. In the US, the company already manages over 1,200 new product launches annually, and Ruiz foresees a future in which the company must become ever more agile—able to pivot quickly to capitalize on a celebrity social-media mention of a nail polish shade, or to match an individual consumer’s skin tone (perhaps conveyed through a smartphone app) with custom foundation delivered in time for tonight’s cocktail party. Speak even briefly to Jolene Baker about her work, and two things come clear quickly. First, she lives and breathes data; she’s passionate about rooting out patterns and the insights they reveal. Success, however, comes for her when those insights can be used to effect positive change in the world—for example, by helping front-line workers to eliminate redundant, non-productive tasks, or using quality data as an early indicator of environmental issues for an oil & gas producer. She’s particularly invested in a project she’s working on now called WaterSMART with the Bureau of Reclamation and OSIsoft to build a community of water data stakeholders in the Western U.S. The goal of the project is a better understanding of water usage patterns and, ultimately, the coordination of more effective conservation efforts. In the realm of data science, she sees the practice becoming easier in the not-too-distant future, so that the tools and insights they can glean are available to a broader range of people and industries. “If the market stays hungry for data, digital experts will continue to build tools that efficiently capture and simplify data analysis,” she says. Jay Gnuse came of age with the personal computer, turning a college gig tutoring staff at local construction company Chief Industries on the use of the popular Lotus 1-2-3 spreadsheet into a career that grew with the IT needs of the Grand Island, Nebraska-based company. As agricultural equipment maker and construction contractor Chief Industries “turns to digital” to continue its expansion, it’ll also turn to IT Director Jay Gnuse to provide a resilient technology foundation and the new, digital tools it will need to further streamline logistics and distribution. building agricultural processing equipment and storage facilities to operating ethanol plants. The number of computers Gnuse manages also has grown in the intervening years—from those first two IBM PCs to more than 850 today. Throughout his time at Chief—as IS manager then IT director—Gnuse always sought to build cost-effective digital systems that reliably supported the growing company’s business objectives. Under his IT leadership, Chief Industries recently served as beta testers of enterprise software from its ERP provider, but he’s most proud of the strong, creative and fiscally responsible team he’s built. “We do a good job of satisfying user needs while keeping costs down,” Gnuse says. From the start of his career at automotive Tier 1 supplier Dana Inc., Allen Blackmore was thrust into the world of manufacturing software and data analytics, where he soon earned a reputation for being able to stand up applications that could begin delivering value quickly. “Not all systems have to be huge,” Blackmore says. “You often have the opportunity to make an impact in a short time.” That reputation served Blackmore well, when the CIO of First Solar was looking to build a team to support the rapid scale-up of production at the photovoltaic systems supplier in the mid-2000s. Recently he’s worked to move all of the company’s manufacturing data into the cloud to facilitate advanced analytics on manufacturing processes. The next step is getting the rest of company’s data onto that same platform—sales, finance, everything. “As First Solar matures, the next evolution for us is a data lake where we can bring in unstructured data. The cloud allows a new scale of analytics that is impossible with on-premise solutions,” Blackmore says. Even as a newly minted chemical engineering grad, Steve Bitar saw his mission in life as finding better ways to do things. “I wanted to see step changes, not incremental gains—all I wanted to do was innovation,” he says. And when he learned that one of the new computers they had onsite at the Mobil refinery in Paulsboro, N.J., could be used move valves, he was hooked. Ask Irene Petrick and Faith McCreary about the work they do at Intel, and it’s easy to see how the duo found each other “at the edge of transformation,” studying the factors that influence how readily industrial organizations embrace digital technologies—and what can be done to ease that transformation’s disruptiveness for the individuals involved. A human factors engineer by training, McCreary’s study of mathematical modeling—“I loved the patterns”—ultimately brought her to NASA’s Jet Propulsion lab, where she worked on the human side of deep space navigation. Then it was on industrial and systems engineering, where she studied how technology is introduced into organizations. She’s currently a principal engineer and user experience researcher in Intel’s Internet of Things group. Petrick took a similarly circuitous path to her current role as director of industrial innovation in the company’s IoT group. She started in business and economics, but she wasn’t quite satisfied with how the models used in these fields often require one to “assume away reality” in order to make them work. She then turned to industry where she studied manufacturing strategy from both technology and business perspectives with a focus on innovation. A stint in academia including a broad range of industry collaborations led to a project for Intel, “and when they asked me to stay, I said ‘yes,’” Petrick says. Clearly, factories of tomorrow will be more autonomous than they are today, and McCreary and Petrick are seeking to help companies understand where their operations fit in the spectrum of future possibilities—and how they can best get there. How does a large, multinational company tap into and leverage the creative ideas of its people when its more than 83,000 employees are spread across more than 40 countries around the globe? “We often say we don’t have technology problems, we have awareness problems.” BAE Systems’ John Kelly has led the development of Empower Innovation, a digital platform to coordinate and encourage innovation across the organization’s 83,000 employees regardless of role or geography, and to evaluate and nurture the most promising ideas. If you’re BAE Systems, you tap John Kelly to build a digital platform to coordinate and encourage innovation across the organization regardless of role or geography, and to evaluate and nurture the most promising ideas. Called “Empower Innovation,” the organization Kelly today directs is equal parts crowd-sourced idea management system and internal venture capital fund. “Our mission is to engage our workforce to solve problems and to develop new capabilities,” he says. Kelly spent ten years at the U.S. Dept. of Defense before joining BAE Systems 15 years ago, and has spent much of that entire time focused on the rapid development of complex, innovative systems. One notable initiative that came out of the company’s Empower Innovation process is the development and scale-up of mixed (augmented) and virtual reality systems that are easier and more efficient to develop and use. The company partnered with PTC and Microsoft to develop “guided work instructions” to both bring operators up to speed quickly, and to assist them during actual assembly operations of complex battery systems. “Training time is down 40%, and assembly time is down 50%,” Kelly says of efficiencies gained using the mixed reality tools. The company also has used mixed reality in critical design reviews with clients to help them understand complex issues quickly, and full virtual reality in the design of factory-floor layouts. “We’ve saved significant time and money,” Kelly says. Graduating from college into the teeth of the oil price shock and early 1990s recession that dampened job prospects in his native Texas, Jeff N. Smith took a flyer: he moved to the Big Apple and soon was swept up in the burgeoning tech boom—first working for publications covering this exciting new frontier, then for a series of tech start-ups. Jeff Smith prides himself on his ability to digest risk in order to place a claim on the future. That outlook has led him from a start-up exchange for carbon credits to now steering the IoT fortunes of Parker Hannifin, the 100-year-old maker of industrial components that go into machines ranging from submarines to spaceships. He’s educating the company’s 150 divisions and more than 300 companies on the financial and technical realities of digital transformation. Indeed, Smith found that nursing a new business concept from idea to reality—then finding customers who could benefit from that new offering—was particularly fulfilling and satisfying. He points to a smart grid technology solution that he helped take all the way from whiteboard to deployment at hundreds of locations across four continents. “It’s really made a difference in their lives,” Smith says. That passion is serving Smith well in his current role as business development lead for Parker Hannifin’s central IoT team. In that position, he’s responsible for helping the $12 billion component manufacturer discover how the new world of connected products and services can be applied to the seven groups, 150 divisions and more than 300 diverse companies that make up the Parker Hannifin organization. Salvaggio is particularly proud of the work the IoT Talent Consortium has done in the realm of education, such as helping MIT to develop its Internet of Things curriculum. Plenty of work remains, however, as indicated by the ongoing disparity between academia assessments (high) and employer assessments (low) of graduating student preparedness. And while the challenges are daunting, Salvaggio’s excited to be able to positively impact workforce preparedness on such a large scale. “I’ve got the best job in the world,” he says. Alan Amling, who today serves as vice president of corporate strategy for UPS, exemplifies the life-long learner. A 26-year employee of the global leader in logistics, he’s now back in graduate school, seeking to help UPS remain as innovative and relevant in today’s increasingly digital economy as it has been for the first 111 years of its existence. But that path forward is anything but clear, says Amling, referencing a recent dissertation discussion with Christensen. “He told me that it would be a great contribution if I could help companies see that the most important information to their future survival is the information that has not been created yet,” Amling says. “Consequently, my prediction is that today’s method of looking at the past to predict the future will be, well, a thing of the past. Tom Gaasenbeek likes to say he is “always up to something.” For example, he came to the early realization in 1994 that all machine tools should be connected to the internet, and celebrates November 11, 2000, as the day the world settled on XML as the standard way to do just that. Among his industry contributions is his work on the OMAC XML effort that ultimately led to MTConnect, the increasingly accepted standard now being used to allow machine tools to participate in the Industrial Internet of Things. Since leaving business school in the 1993, Altimeter’s Charlene Li has felt most at home in the midst of digital transformation. So much so, that she wrote the book. Look for "The Disruptor’s Agenda: How to Create a Strategy for Breakthrough Growth" at bookstores and online coming in February 2019. Narinder Singh is leading the efforts of global agribusiness leader Olam International to define the strategic roadmap for manufacturing operations and procurement that will deliver Olam’s vision to be “the most differentiated and valuable global agri-business by 2040.” Across the company, he is working with diverse, multifunctional teams—including both “digital dinosaurs” and Millenials—to evaluate those transformations that are most important to the company’s future, anticipate digital disruption to get benefits of early mover status, and establish a digital culture for the future.